Add the potatoes to a large pot and cover them with water. Add in 1 tablespoon of salt. Place over high heat and bring to a boil. Boil until the potatoes are fork tender, about 20 minutes. Drain the potatoes. Preheat the oven to 450 degrees. Place the potatoes on a baking sheet that has been coated with olive oil. Using a meat cleaver or the back of a glass, press down on each potato to flatten them out. Brush them with oil and season them with salt and pepper. Bake for 20-30 minutes or until the potatoes have crispy edges. While the potatoes are cooking, stir together all of the aioli ingredients. 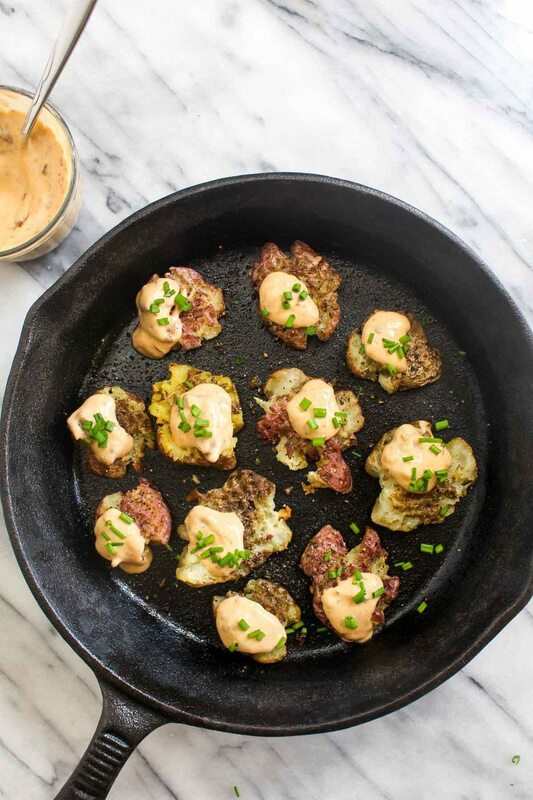 Serve the potatoes with the aioli.